One of my best memories of Fall was when my mom would make a big pot of chili and some cornbread for dinner. It became a Halloween tradition: grab a hearty bowl of chili before heading outside to trick or treat. I’ve continued that tradition whenever my friends and I hit up a pumpkin patch or visit a corn maze. Chilly and starving, chili really hits the spot. Chili bars are a fun and easy way to dress up a pre-made chili and make sure everyone’s getting what they want. Just put out some of the items listed below along with some bowls, utensils, and napkins, and let people grab and go! Keep the chili in a crock pot or buffet warmers if everyone won’t be eating at the same time. Want to try out some chili for yourself? Progresso’s letting me give away a prize pack with chili and stew, a fancy ladle, and a cooler chair so you’ll be set for gamedays and tailgates! Just visit progresso.com/gameday, and then leave a comment here with your fave recipe. I’ll pick a winner on Thursday, October 8th! Don’t want to wait to win? Grab yourself a $1 off coupon now! 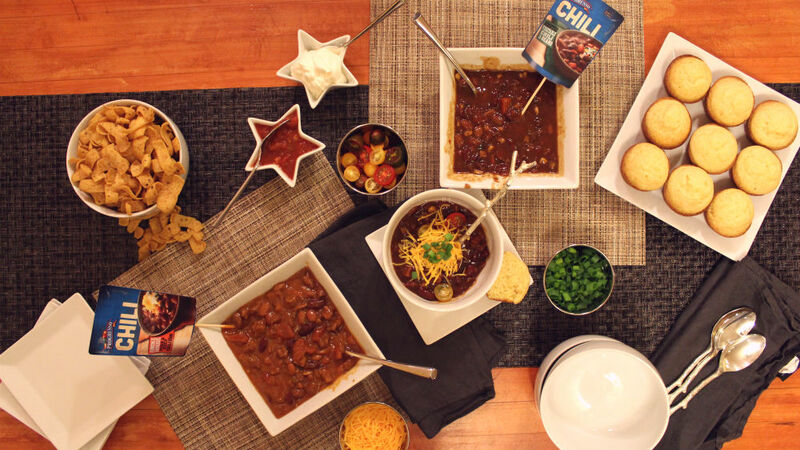 What’s your favorite way to prep chili? Do you have any Fall food traditions? The Buffalo Chicken Dip looks tasty! You’re Chili bar looks amazing, what a good idea. I need something quick since i forgot all about food for tonight’s Monday Night Football game, I can totally pull something like this off last minute. I make a simple Chicken pumpkin chili in the crock pot that I really enjoy. Also I think doing a Chili bar is a great idea for our Super Bowl party!! I’m super excited for February now!! All these images and recipes are making me hungry… I used to bring chili to work for lunch all the time, but just realized I haven’t in quite a while. TIME TO CHANGE THAT. Also, my mom has a great recipe for white chicken chili. I don’t know it off the top of my head, but I’ll have to get it from her! It’s delish. The Chicken Stew Biscuit Cups look great – and swapping in some chili would work too. Ummm…chicken stew biscuit cups?! You had me at biscuit. Chili Tachos oh my. Tater tots! I would love to try the black beans, chicken, and rice! Yup. I’d totally mod their Chicken Chili Nachos recipe to make fast Chilaquiles over Juanita’s tortilla chips, garnished with minced red onion, avocado, and shredded Manchego cheese. I want to make the Enchilada Soup.